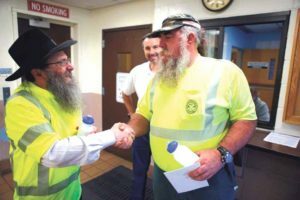 Rabbi Anchelle Perl (left) visited workers from the Town of Oyster Bay Sanitary Collection Services Division to express his gratitude for their hard work. What’s the answer to the world’s problems? If you ask Rabbi Anchelle Perl, of the Chabad of Mineola, the answer is simple: gratitude. Perl is taking steps towards harmony this summer, with his “salute to sanitation” initiative. 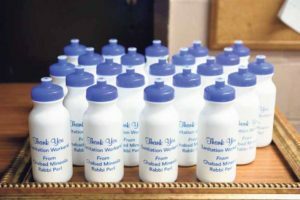 Perl, along with members from the Chabad of Mineola, are visiting sanitation departments all over Nassau County, bringing workers water bottles and expressing their thanks for all their hard work. “These people go about their work every day to keep the community clean and healthy. We wanted to reach out to them to show them our appreciation,” said Perl. 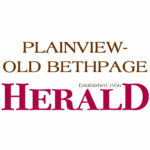 Perl plans to stop at various other sanitation departments over the summer and expects to meet with 500 workers. The first stop was last Thursday, July 14, as Perl went to the Town of Oyster Bay’s Department of Public Works in Syosset to meet workers and hand out water bottles. The experience was exhilarating and moving, said Perl.